If you have any experience living where there is a feral cat population, you know how quickly the number of cats can increase – exponentially! 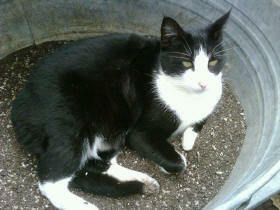 Since I’ve owned this farm, stray or feral cats haven’t really ever been much of an issue. 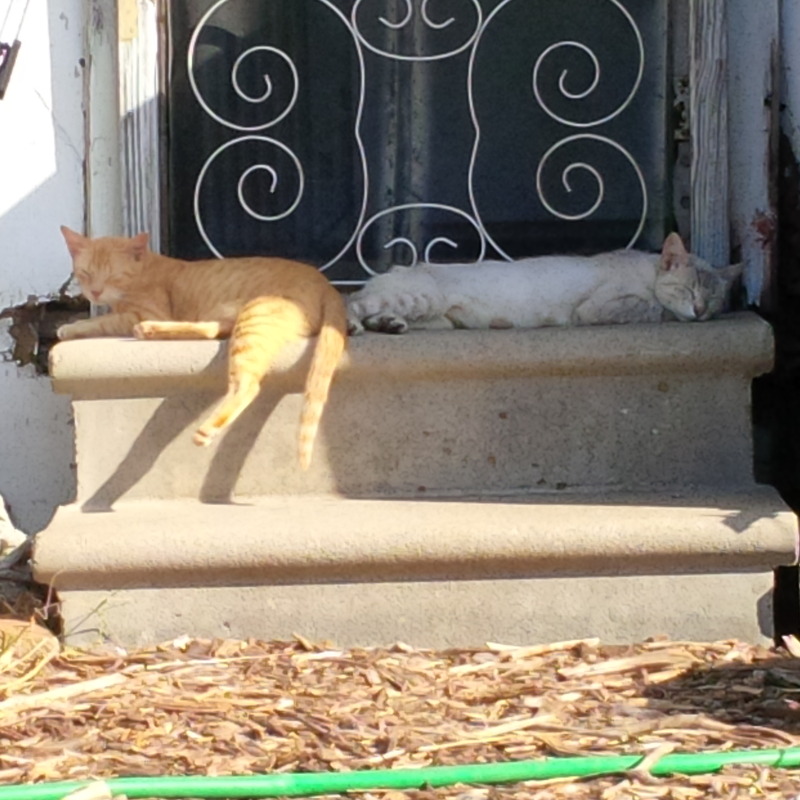 Well, the only 2 strays I did find, ended up house cats – so, no issue, right? But I was about to learn, and learn quickly, what an issue a couple of seemingly innocent stray cats could become. Recently, a neighbor sold their place and unbeknown to me, 2 young, un-spayed female cats were left behind. Apparently one of their horse boarding customers had been managing the “barn cats”, but these two had either matured after she had left or they got missed somehow. There had been an intact yellow male cat who would occasionally visit Eve, my resident shop cat, but she had been spayed so there was no issue. Or so I thought. I’m kicking myself for not trapping and neutering Yellow Tom when I first discovered him hanging around with Eve; but I knew of no other cats in the area at the time, so it didn’t seem a priority. How quickly priorities can change! Cammo Kitty, the gypsy female, as I mentioned, appeared out of nowhere. I noticed her suddenly, and she was "with kittens". “Where did YOU come from? !” And what was I going to do with her and a litter of kittens? Yellow Tom had discovered the two young ladies next door – and a third who I guess lived as a gypsy, because she'd never been seen around here by anyone – and well, suddenly, I am up to my eyeballs in kittens! Eve had retired to the house, as of this past winter – after 10 faithful years as shop kitty. After recovering from a leg injury, she showed zero interest in returning to her post outside. Zip. None. Nada. She snuggled in with me every evening after dinner and seemed quite content – so long as those boys in the other room left her alone. So, I let her stay in the front of the house with me. This, however, I found, opened the door – figuratively anyway – to potential new residents at the shop. I started noticing a small yellow cat and what I swore the first few times I saw the flash of fur, was a possum. Plus Cammo Kitty hung out near my house, which Eve used to frequent just to torment my inside cats, but of course had now abandoned. Following the man who’d taken over feeding them, when he moved his horses to be boarded here, were the two females left to fend for themselves next door after the neighbors moved on. Once the cats heard his voice and recognized his car – they more or less moved over with him. Well, it wasn’t long before I noticed one of the next door cats looked a bit heavy. And even though I’d not noticed Yellow Tom around for a long time, figuring that he’d moved on since his friend Eve was not outside anymore – nor was her food available to share –– it was obvious he made at least one last visit….. to “Lil Yellow” and her littermate, "Possum Kitty" who was also showing a bit of a bulge. He called upon, I suspect, Cammo Kitty as well, who apparently was his first rebound girl after Eve was no longer available to pal around with. You know, any ol' port in the storm, as they say. Humph! So now what? I had no idea how long that a cat carried kittens for, how many weeks in between they had a litter could they get pregnant again, etc., much less how I was going to afford to feed and alter all of these cats it seemed I was sure to inherit? Since all of my pets, have always been altered, I was pretty unfamiliar with all of the particulars. As it turned out, Cammo Kitty’s kids as well as she were “wild as fire” – as they say. I couldn’t even look at her without her hissing and spitting. Her kittens had become just as wild. So I knew I’d just have to trap, neuter and release them. But my goodness, I thought I’d seen 5 or 6 kittens! This was going to cost me a small fortune. Plus, I couldn't let them go hungry. They'd surely all been helping Eve eat her food - which explained why she went through food so fast. Lil Yellow and Possum kitty were a bit more tame – hissing AS they approached the food bowl you put down for them, but still approaching you nonetheless. I hoped at least their soon to be kittens might end up friendly. It would be nice to have cats that could be petted by visitors again. But then again, how would I ever afford to vet and feed them all? Then, soon enough, the 2nd litter came – in my lawn mower bag. Lil Yellow had brought her litter to my garage for safety I supposed. I took a few pictures of the day old (or so) kittens and posted on Facebook – of course – with the lingering question – now what? In the meantime, Possum kitty disappeared – and about two weeks later – reappeared, much thinner. Now I’m about in panic mode. Three mommas. Three litters. Thanks to a lovely couple from the early days of my CSA, I'm able to have working farm dogs. The farm’s 2 LGD’s vet expenses and some of their food costs are sponsored. That’s right; my dogs sort of have “godparents”. I can't tell you how grateful I am and it was the only way I agreed to get them. But I didn’t have sponsors for stray cats, nor did I think I could really justify asking for any - after all, in the kind of numbers I had, they'd really not have a direct benefit to the farm; and the only place I had known of for low cost to almost free spay/neuter, from what I understood, had closed. 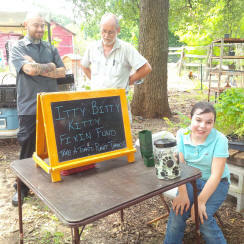 Chef Justin Box and CSA member Jerry look on as our cute as a button CSA member Vicky makes pitches for the kitties. She was hard to resist!